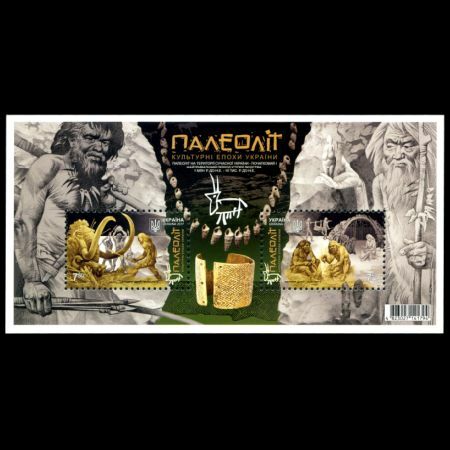 Ukraine 2017 "The Cultural Epochs of Ukraine: Paleolithic Age"
On January 20, 2017, Ukrainian Post issued a block with two stamps inside: "The Cultural Epochs of Ukraine: Paleolithic Age". 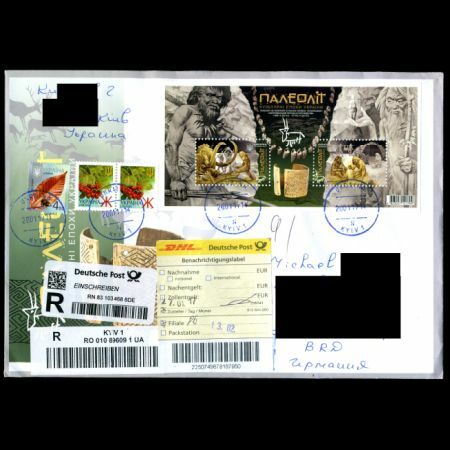 The stamps shows scenes from Upper and Middle Paleolithic Age. "The oldest cultural and historical period in human history, was Paleolithic era. The Paleolithic age is divided into early (lower) (3 million. - 450/300 thousand. Years ago), medium (450/300 thousand. - 40/35 thousand. Years ago) and late (upper) (40/35 ths. - 14 / 13 thousand. years ago). During this time, human beings have gone a long way, starting with the separation from wildlife to people the appearance of modern anthropological type. There are stone tools and the first clothing, use of fire and built the first housing. Forming complex religious beliefs and development of art. There is formation of hunting societies. It impossible to imagine further development of mankind without this period . There are many Paleolithic stops are found on the territory of modern Ukrain. One of the most valuable and unique is Mezhyrich Camp. Such camp complexes in the world found less than half a dozen. One of the residents from the camp is on display in the" National Museum of Natural Sciences of Ukraine" in Kiev. Part of the camp donated to American Museum of Natural History." 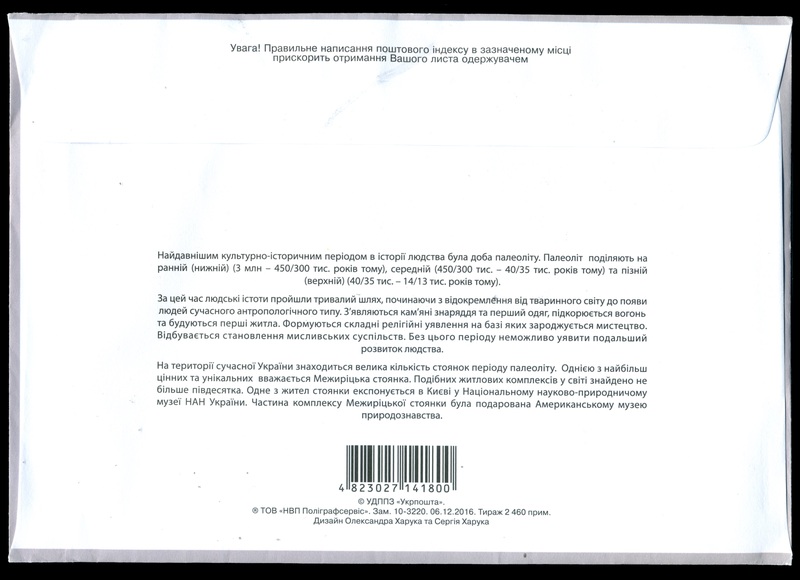 Mezhyrich (Ukrainian: Межиріч, also referred to as Mezhirich) is a village in central Ukraine. It is located in the Kaniv Raion (district) of the Cherkasy Oblast (province), approximately 22 km from the region's administrative center, Kaniv, near the point where the Rosava River flows into the Ros'. In 1965, a farmer dug up the lower jawbone of a mammoth while in the process of expanding his cellar. Further excavations revealed the presence of 4 huts, made up of a total of 149 mammoth bones. These dwellings, dating back some 15,000 years, were determined to have been some of the oldest shelters known to have been constructed by pre-historic man, usually attributed to Cro-Magnon.